Telegram continues its consolidation in the world of instant messaging applications. Although it’s still far from the volume of WhatsApp users, more and more people are using it as an alternative app for their IM communications. WhatsApp is still limited in terms of platform support, and Telegram has carved a niche among the users thanks to the possibility to use the same application on smartphones, tablets and PCs. 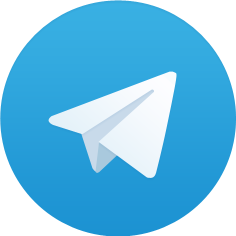 Now Telegram has announced an upgrade to version 1.9.3, which includes support for Android Wear. From now on, we can receive the instant messages directly on our smart watch. With this step, Telegram vocation to be a complete multiplatform app is consolidated as another device has been added to the list. On the other hand, for Voice Notifications is an interesting app, which is able to read aloud the messages we receive from various messaging applications such as WhatsApp, Gmail, Line, Viber or Telegram. The app uses a TTS reading system (Text to Speech), and the PRO version can also reply to the messages. The app needs Android 2.3.3 to run properly, and the device must also have a TTS installed. One of the best TTS apps currently available is IVONA Reader, although there are other free apps with good quality in the market. Finally, you must have Internet and the app activated on the Accessibility menu, which can be found under the Settings menu. Currently, Voice Notifications offers support for 5 languages: English, French, German, Italian and Spanish. The PRO version, which offers the ability to respond to WhatsApp messages, requires Android 4.4 installed. Finally, for Voice Notifications is also compatible with some smartphones. Up to now, it doesn’t provide support for Android Wear, but we can listen to the messages and notifications we receive in the Pebble Watch or in the Sony smartwatch. 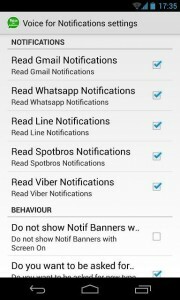 You can download Voice for Notificacions and Voice for Notifications PRO from the Google Play.